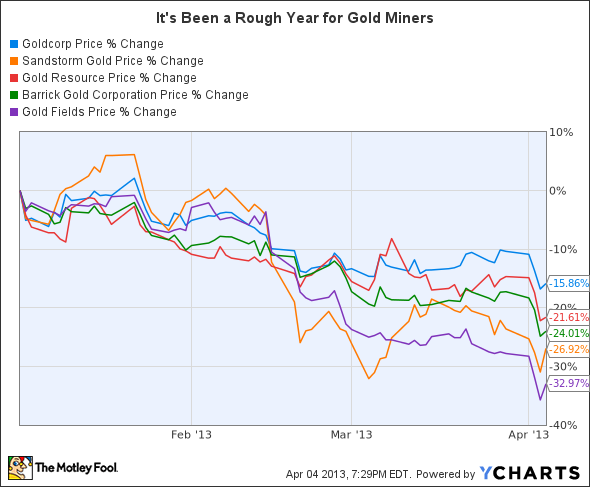 Have Gold Miners Lost Their Luster? I hope you didn't stare at that chart too long; it's pretty brutal. What happened, and is now time to invest in these gold miners? Gold, which is viewed by many investors as a safe haven just hasn't been needed in recent weeks. The precious metal hit a 10-month low earlier this week as signs continue to point to a strengthening economy. It's also quite possible that we're becoming immune to bad news. European fears of a contagion from Cyprus eased almost as quickly as they flared up. Even sabre rattling from North Korea hasn't seemed to strike too much fear into the markets when that country supposedly has the capabilities to wipe Los Angeles off the map.You'd think that would have people buying gold and running for the hills. Amid all this, overall investor interest in gold has fallen to the point that Credit Suisse has cut its price prediction for gold to $1,580 an ounce this year and $1,500 an ounce for next year. Given that gold is the contrarian's investment of choice, now just might be time to be that contrarian and buy a gold miner. The hard part is determining which gold miner to buy. While it hasn't fallen as far as some of the names on my dismal chart from above, Goldcorp is viewed by many as being the gold standard when it comes to gold investments. That being said, if you like income you might want to look at Gold Resource as it pays a high monthly dividend. You're options don't end there -- Barrick Gold offers investors the opportunity to invest in one of the world's largest pure gold mining companies. As you can see, it gets complicated very quickly. That's why I think a lot of investors might be drawn to a company that simply enables you to profit from the price appreciate of gold. By taking away the operational risks that can tarnish the names I just mentioned, gold streamerSandstorm Gold is a company that's worth a deeper look. The company has a management team that's experienced in streaming and a diversified production base that should yield long-term returns. Moving away from operational risks is more important than you'd think. Take Gold Fields for example, the company's operations at its two mines in Ghana were halted recently after a strike broke out over a pay dispute. This isn't the first time the company has been hit by labor unrest as a 23-day strike shut the company's South African mines last year. Halting production can really impact the bottom line, which is one reason why the company's shares have of been the worst performing of the bunch. Production halts are just one of the many potential missteps that can befall an investor in a gold miner. Consider this quote from Barrick Gold CEO Jamie Sokalsky after the company booked a massive impairment charge: "Rising costs, poor capital allocation and the pursuit of production growth at any cost in the industry have led to declining equity valuations across the sector. The message is clear: the industry must chart a new path forward." While Barrick is now charting that path, it's stock has still been hit hard this year. With that as a backdrop, is it time to buy a gold miner? Only if you have a long-term time horizon and are investing in the business and not the ticker symbol. Each company mentioned has its own unique set of risk factors that will play into its long-term performance beyond what the price of gold does. If you're looking to dig a little deeper into the gold miners might I suggest Goldcorp, which is one of the leading players in the gold mining market. For the last several years, investors have been the beneficiaries of several successful acquisitions and strong organic growth. Goldcorp's low-cost production of one of the most sought-after metals in the world continues to make this stock an attractive choice for long-term investors. To learn everything you need to know about this mining specialist, you're invited to check out The Motley Fool's premium research report on the company, which comes with a full year of ongoing updates and analysis to keep you informed as key news breaks. Click here now to claim your copy today. The article Have Gold Miners Lost Their Luster? originally appeared on Fool.com.